Source: "From College to Life: Relevance and the Value of Higher Education" from Strada Education Network and Gallup. In college, relevance matters. A new survey of consumers found that the more tied their college courses are to their work and daily lives, the greater they believe they've received a "high-quality education" that was worth the cost. Among respondents to a Strada Education Network and Gallup survey, those who "strongly" agreed that the courses they took are directly relevant to what they do at work and that they learned important skills during their education that come in useful day-to-day were nearly three times more likely to strongly agree that they had received a high-quality education, compared to those who strongly disagreed. And the same group was five and a half times more likely to strongly agree education was worth the cost, compared to those who strongly disagreed. The two organizations surveyed a nationally representative sampling of 78,091 adults ages 18 to 65 who have taken at least some college courses and who are currently employed. 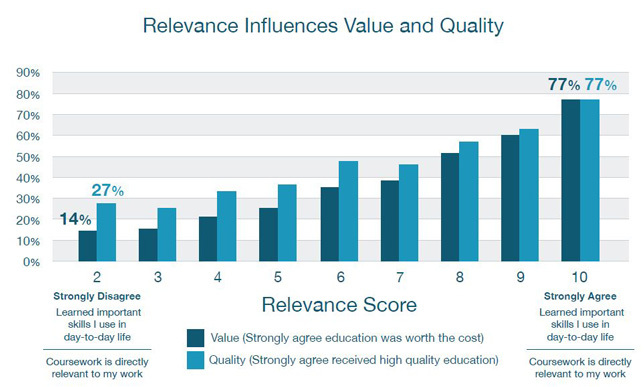 The results are shared in "From College to Life: Relevance and the Value of Higher Education," the first of three reports that examine the importance of relevance in higher education. According to the researchers, relevance also comes into play as a better predictor of how people would rank their colleges. 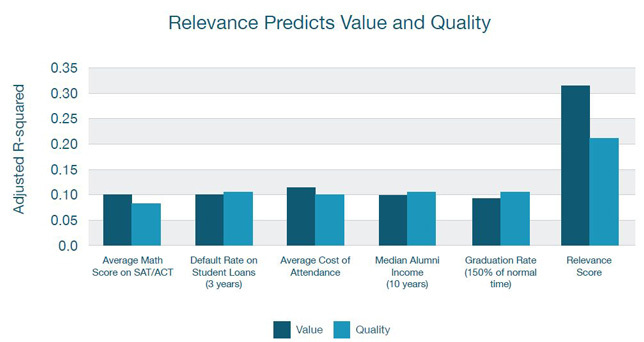 "Relevance scores are more powerful predictors of consumer satisfaction than average SAT/ACT math scores, student loan default rates, average cost of attendance, a measure of alumni income earnings and graduation rates," the report stated. Relevance of education is likewise tied to well-being. Respondents who strongly agreed that their courses were relevant to their current lives and work were 18 percentage points more likely "to be 'thriving' in their overall sense of well-being," the report noted. "The voice of education consumers is very clear about how essential relevance is when it comes to finding quality and value in postsecondary educational experiences," said Dave Clayton, senior vice president of consumer insights at Strada, in a prepared statement. "The sheer magnitude of impact we see in these findings provides a compelling mandate to fully understand relevance so we can meet consumers where they are and help them make the progress they seek in education, work and life." Strada has skin in this game. The nonprofit is dedicated to tightening the pathways between education and employment as a way to strengthen student success. Previous Strada research conducted by Gallup found that people were most likely to be motivated to enroll in higher education for better job and career outcomes, and that the most valued advice in choosing an educational path or field of study came from "work-based sources." The next report, expected in early May, will delve into the "predictive power" of relevance for education and work; the third report will share insights on how institutions of higher education can transform themselves to be more responsive to the needs of students and employers. The first report is openly available on the Strada website.